Over the years Shellac has had many uses, it was used to insulate early electrical wiring, the first gramophone records were made of it and for centuries it has been known as the king of finishes. Shellac is one of the most versatile of all wood finishes. it can be thinned and used as a sanding sealer or a base to build a wax finish upon. It can be applied with a brush or a pad to give a full French Polished finish, coloured for dramatic decorative finishes and more. Shellac is available in a variety of forms, these include button shellac, blond, ultra blond, granulated white lac and golden or orange flake shellac. The most readily available and versatile of these is the Golden or Orange Flake Shellac also known as SILTN, it dissolves readily in Ethanol (methylated spirits) and can be used in a variety of ways. Flake Shellac has a virtually unlimited shelf life if kept dry, cool and out of direct sunlight, thus making this the most practical way of purchasing the product. 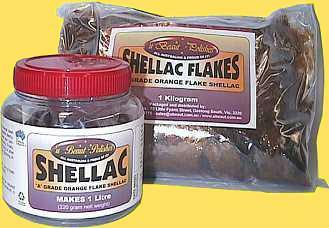 Liquid shellac is definitely best when used fresh so do not mix your Flake Shellac until you are ready to use it. Do not use a metal container to store liquid shellac (French Polish) as this will degrade the polish at a very fast rate. This mixture may be thinned as required with methylated spirits. French Polish can be used in a number of ways. It can be brushed on to new timber in a series of coats to give a bright finish. It can be applied with a pad or rubber as in French polishing. It can be thinned and used as a a sanding sealer or a base for applying a wax polish. If you are not experienced at using French Polish you would be well advised to undertake a class in polishing or at least obtain information from a good book on polishing or from someone who is experienced in using the product. Although French Polish is very versatile and reasonably easy to use for some applications it is not advisable that the novice just jump in feet first and start splashing it about willy-nilly all over a piece of furniture. The following section will give you some basic instructions on using French Polish without tears. The following information is only very basic information and should in no way be taken as a tutorial on using French Polish. 1/ Applying with a brush. This method will build several layers of polish in a short time. You will need a good quality brush. Preferably a Polishers Mop or Artists Mop with Camel hair or Sable bristles. These brushes have extremely soft, fine bristles that act as a reservoir for the polish and give an almost perfect finish to the work. Take a small portion of your polish and add approx. 25% methylated spirit to dilute the mix. Dip your brush into the polish then remove the excess on the side of the polish container. The brush should be loaded with polish but not dripping. Apply the brush lightly to the work and glide it in a steady, constant line from one end to the other, then repeat on the next stroke which should barely overlap the first and be slightly heavier. Continue this process until the brush needs to be re-filled with polish and you have covered the whole surface. This first coat will take between 10 & 15 minutes to dry. Re-coat two to three more times in the same way, allowing drying time between coats. You now have a base upon which to build a number of finishes. Allow a day for drying then sand the above base with wet and dry abrasive 400 grit then 600 grit, use water with a little dish detergent in it to sand with. After sanding dry the surface thoroughly then burnish the surface with 000 or 0000 steel wool. Use a damp rag to remove any dried powder left in the pores of the timber. Now apply a coat of Traditional Wax to the surface and buff to a brilliant lustre. Sanding Tip: Be careful not to sand through the polish to the timber. Always sand with the grain. This finish is applied with a rubber (a pad made by wrapping linen or cotton sheeting around a pear shaped filling of cotton wadding) This form of polishing is best done after formal instruction. It is used for the finest furniture. French Polish can also be sprayed on to a surface by means of conventional or airless spray equipment. This is usually used as a base for other finishes. The coloured polish is usually applied by means of a brush or spraying. If used over a white base it can give some startling effects especially if used for scumbling or with a stippling brush or sponged. Decant off about 20mm of French Polish into a clean glass jar, add an equal amount of methylated spirits then add about half a teaspoon of our Talc to the liquid and mix in well. This can be painted onto the surface of an open grained timber as a sanding-sealer/grain-filler. When it dries it is easily sanded leaving a silky smooth base upon which to continue your polishing. If the timber colour is muddied by the talc mix add extra French Polish and meths.